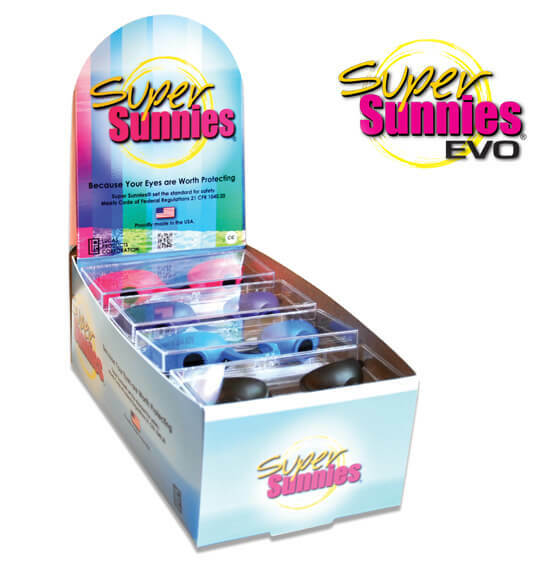 Offer customers protection while tanning with our Lucas® Super Sunnies® EVO Eyeshields Counter Display. This durable, full color printed counter display is narrow in width and can easily tuck into any checkout counter as a point of purchase display as well as sit nicely on the shelf in your retail space. An ideal & convenient way to showcase an array of Super Sunnies® EVO Flexible Eyeshields and the myriad of color choices.